Construction Development Corporation Limited (CDCL) becomes the first national company to venture into hydropower construction. The company is currently working on the final stage of preparing Detailed Project Report for Nyera Amari Hydroelectric Project. 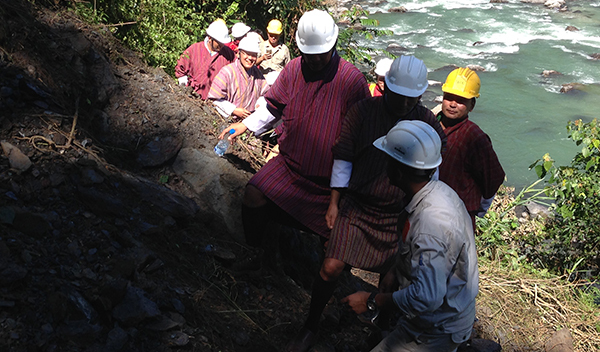 Some 40 Bhutanese men are working at three different sites of the project at Thrimshing, Gomdar and Martshala in Trashigang and Samdrup Jongkhar. They have already excavated a 60-metre tunnel in Thrimshing to study the feasibility of the area for the project. Last week, the company also started the excavation of another tunnel at Martshala. For their current project, the company will have to excavate a nearly two-kilometre tunnel in the next two years. With about 700 employees and all the required equipment procured for hydropower construction, CDCL is confident to go about with their first mega-project. “We have taken a small step now but we are looking for a major construction of hydropower in the future. In fact, we have already trained so many young professionals in this field and especially in the construction of a head Race Tunnel,” said CDCL’s Director, Pema Wanchuk.